The Preservation Hall Jazz Band swings at the Blue Note tonight. 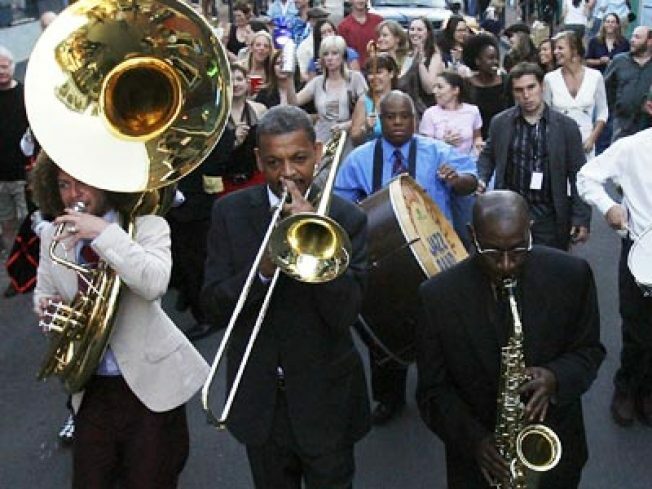 WELL-PRESERVED: The Preservation Hall Jazz Band is the last word in traditional New Orleans dixieland jazz. They may have struggled since Hurricane Katrina, but they're still doing what they do better than almost anyone. Blue Note, 8 and 10:30PM, through 4/4. BIG NIGHT: Zooey Deschanel is wooed by a Brooklyn mattress salesman (Paul Dano), but she's not quite ready to take things to the next level, i.e. be the mother to the Chinese newborn he's decided to adopt. Toronto Film Fest fave Gigantic opens Friday, advance-screens tonight at 92YTribeca. 7:30PM. BLACK HOLE SUN: BAM Rose screens The Sun's Burial, Nagisa Oshima's new-wave classic from 1960 that fixes its gaze on restless youths in the seedy slums of Osaka with nothing to lose. It doesn't quite beat I Love You, Man for levity, but it's a fair bit more enlightening. 6:50, 9:15PM.